In this late afternoon shot, the crew aboard the International Space Station (ISS) looked back toward the setting Sun and captured the hook-shaped southern half of Lake Baikal in eastern Russia. Most of the lake is covered with dull gray ice. The brightest point in the image is the reflection of the Sun’s rays off a small zone of open water where the ice has begun to melt. Broken ice masses appear adjacent to the sunglint point. Sunlight also reflects off the water surface of the straight Angara River, the main outlet of the lake. 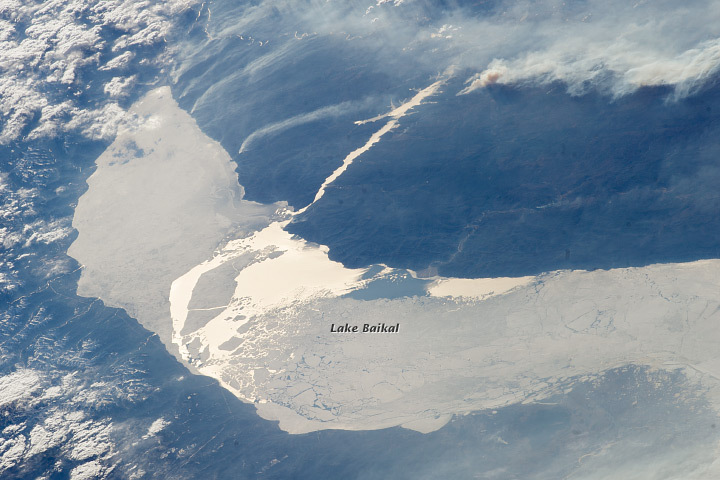 Lake Baikal is 636 kilometers long (395 miles). It is the deepest lake in the world and by volume holds the largest amount of fresh water. Large smoke palls from wildfires appear on the top and upper right of the image. Smaller, individual smoke plumes arc away from the north shore of the lake (image top left), perhaps from factories, fires, or other infrastructure. You can see a wider view of the same area, captured at nearly the same time, from the Aqua satellite. Sunglint is more fully described here. You can see other examples of sunglint images from the ISS over North America and Europe.